It had been a long time since we’d played, so we presented the rugrats with the idea of starting over. Rugrat #1 wasn’t too sure about it; he wanted to move on to the next part. We asked if he wanted a friend to come join us, and pointed out his friend might want to start at the beginning, and so it was agreed. This initial part is run much like a board game, introducing kids to their character sheets by way of skill challenges. Once players reach the end of the path they face off against the large tree, giving everyone a chance to test out their combat skills. 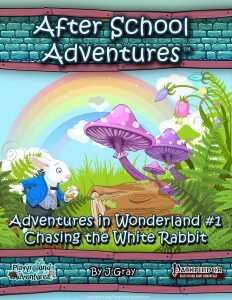 This first adventure is a great primer to games in general, not just roleplaying games. It gets the players used to rolling dice and moving their miniature across a board that is not unlike the board used to play Snakes and Ladders. Along the way, they will be introduced to Pathfinder RPG game terms, such as saving throw, attack roll, and skill check, as well as being introduced to the game’s central mechanic. The rugrats remembered this from last time, and our 5-year-old barbarian grinned as he got the final blow (again). When we finished this adventure, we asked the kids to summarize what happened. Kelly and the kids were sucked in the rabbit hole and Rugrat #1’s friend looked a bit nervous. Then he asked if he could tie the rope in his inventory to an arrow, and attach that to the wall in case they started to fall. As written, there is no real threat here, but it was inspiring to see the problem-solving in action, so we had him roll it up. He looked so pleased when he succeeded. And so we began the dictionary challenge. Friend recognized the weasel song the dictionary sings right away and bobbed his head along to the song. Rugrat #3 just continued to repeat what I said about the book. Rugrat #1, who loves to read, enjoyed this challenge immensely, and even Rugrat #2 confidently chimed in with a few words. The part with the potion and the cake was a little more troublesome for the kids. Our rugrats have been lectured extensively to never consume anything that isn’t food and that we didn’t give them (there were a few too many cases of them chewing their nails, biting lego, and licking shopping cart handles). It took a bit of urging, and Kelly going first, for the kids to try the consumables, but in the end they did, and through the door they went, into the next adventure. 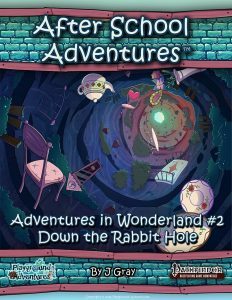 The second adventure is really fun and reinforces the idea that the players can use their imagination and their wits to overcome challenges. 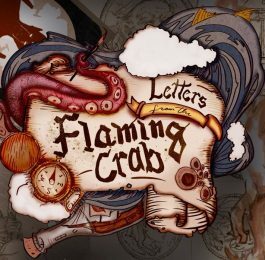 Clever players can likely make their way through this adventure never needing to roll dice. The module is also tame enough that even the most sensitive person will have no problem playing through it. We don’t want to spoil all the surprises in this adventure, but once again we asked the kids for a summary of the journey so far. The third adventure has the players run the Dodo’s obstacle course. There are dragonflies, representing tally marks, following the characters around; anytime they were addressed, I had them respond by saying their names were all Mark. Rugrat #1 loves puns, and the idea of the dragonflies being called “Mark” was hilarious to him. When I said there were pictures of large dragonflies on the ground where they were meant to stand, and that their names were “Mark” as well, he looked amused. When they started saying “Hey, I’m Mark” too, he broke into hysterics. 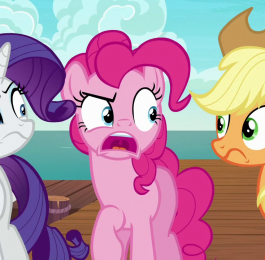 Honestly, this whole adventure had the kids in stitches once they figured out what was going on. At first the dodo’s strange way of speaking and constant misuse of words confused the kids, but once they figured it out, they just kept giggling. Adventures in Wonderland #3: The Dodo’s Race has the PCs face off against some gelatinous blobs. When we played the adventure the first time (in late 2016), Kelly made Jello jigglers; this time she opted for a bag of candy. The small pieces of coloured sugar stood in well for the opponents on the battle board, and the kids were able to eat them once the foe was defeated. Needless to say, this was a hit with the kids. By this point in the adventure path, the kids had the hang of some of the common RPG terminology and the dice, including which one was used for which purpose. Rugrat #1 and his friend both wanted to heal Rugrat #2 when he got hurt. They started asking around the table who had the best heal and were super concerned, but thrilled they won the prize chest from the Dodo. 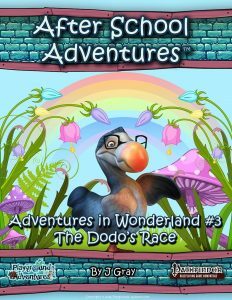 The Dodo’s Race is another good installment in this series. It promotes team play, and reinforces that each character is going to have strengths and weaknesses, and that we work together to deal with situations as they arise. It also does a good job of giving the players choices. At no point are they forced to combat the various jellys, but they will make the subsequent tasks easier if they do. It’s a great mini-module for young players. This was new for the Rugrats, and for us, which brings us to the biggest disappointment of this series – it takes forever to be released. There is amazing art, fantastic maps, and a great story, but the huge gaps in release dates makes it difficult to keep the momentum going in any campaign, but especially one with kids. The players made their way into the duchess’ home and eventually found their way to the ball pit where they were set upon by the snake-like baby mimics, who seemed to come out of nowhere. We rolled up initiative again, each time easier than the last as the kids were getting the hang of where to find the information. Rugrat #1 remained the best at adding the necessary numbers, but with a little encouragement, he gave his friend a chance to work on his own arithmetic helping out only when he or Rugrat #2 got stuck. 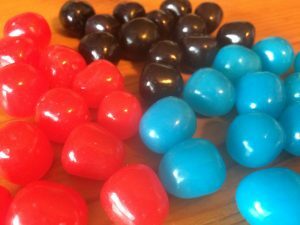 We used the candies from the third adventure to represent the baby mimics, and once again, the kids were thrilled to defeat them. When the first one was destroyed (aka: eaten), the kids all chimed in saying it would be a great idea if each of them defeated a snake (and ate the corresponding candy). The thoughtfulness of that admittedly surprised Kelly and me who expected them to just fight over the candy. It also worked out really well that each child did take out their own snake, with a little help from Mama Witch who used a sleep hex on each of them. There was, of course, a bag of candy just in case the barbarian took out more than just his share. We were running short on time at this point, so I truncated the search through some small tunnels and moved everyone along to the final encounter of the module (skipping the mirror ray encounter), which Rugrat #1 crushed due to his knowledge of the colours of the rainbow. The players then discovered the Duchess’ message around the neck of a cute stuffed bear. 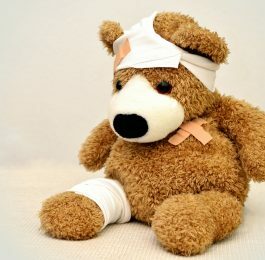 The bear is intended to be given to the characters as a reward, but the Duchess decided against giving it to them, since they opened her message without permission… whereupon the roguish friend decided to steal it from the narcoleptic woman, reasoning that it was okay because the game is just pretend. 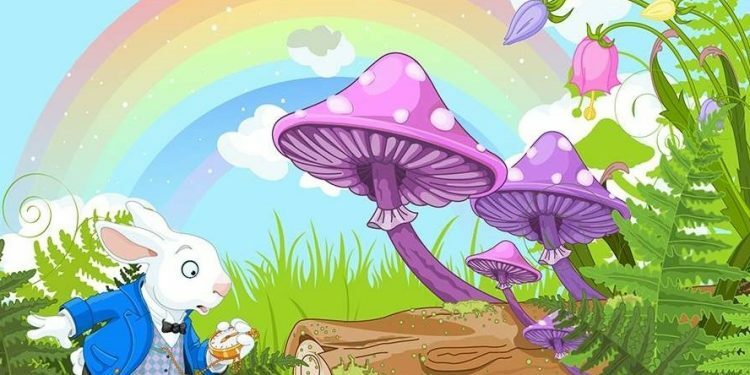 The party then moved on in the direction that the Duchess told them she saw the white rabbit move in, and the game ended. 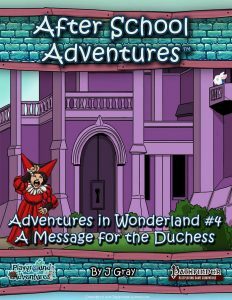 A Message for the Duchess is a fun little mini-dungeon for new players to romp through. None of the challenges is too much for clever players. What was your favorite part of the whole adventure? I would highly recommend these adventures for new players. The way they gently increase the learning curve is excellent, acclimating the players to each mechanic as its introduced. On the whole, the only negative aspect of this mini campaign is that the modules are coming out slowly, and that the kids ask daily when the next one will be released. What’s your favorite thing about playing Pathfinder? Do you play any RPGs with kids in your life? Have you checked out the Playground Adventures line of products before?